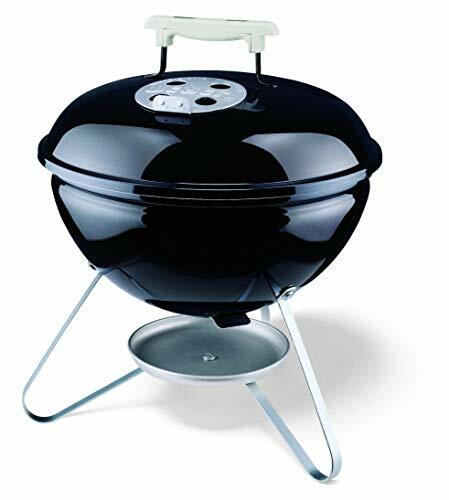 Portable grills like the Weber Smokey Joe Premium 14-Inch Grill are popular with people who like to camp, host a cookout at the beach, or tailgate before the big game. 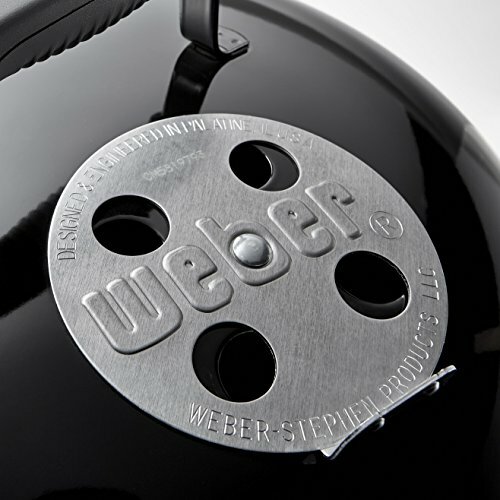 The Weber Smokey Joe charcoal was designed to provide these people with the opportunity to take fire-kissed charcoal flavor with them on the go. 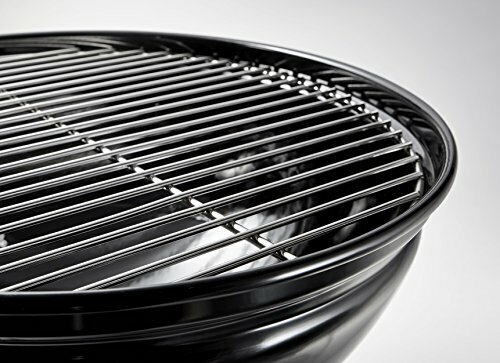 The 14-inch grill grate is just large enough to grill burgers or brats for a group of four to five diners. Yet it can also handle something like grilling a batch of chicken wings. 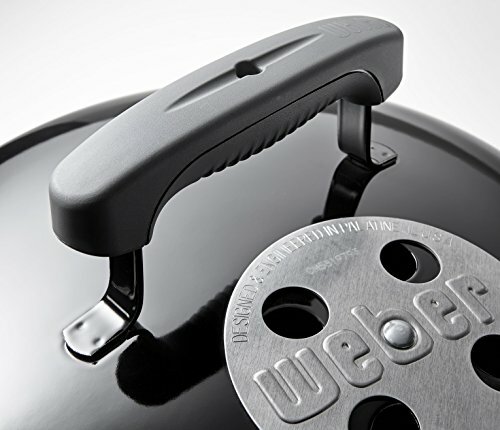 Weber designed the Smokey Joe to be lightweight and easily portable. It also features a special Tuck-N-Carry locking lid helps with transport safety. It is also coated in special heat resistant black enamel to help resist rust and corrosion. The lid also incorporates dampers that allow you to not only control the airflow relationship to the fire, they also secure tightly to help suffocate the flame after you are done cooking. 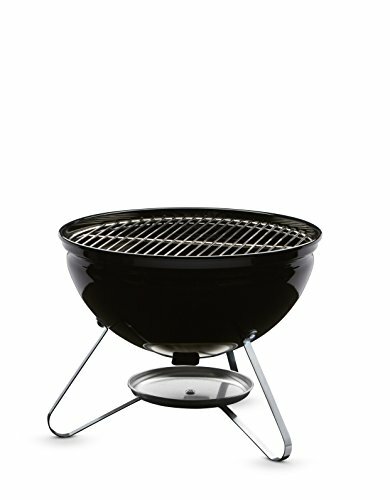 Like most of Weber’s kettle style grills, the 14-inch Smokey Joe was designed to be durable and easy to assemble. It includes an enamel coated body and firebox with rust-resistant dampers made from aluminum. The lid also has an insulated handle and locks in place for added safety. 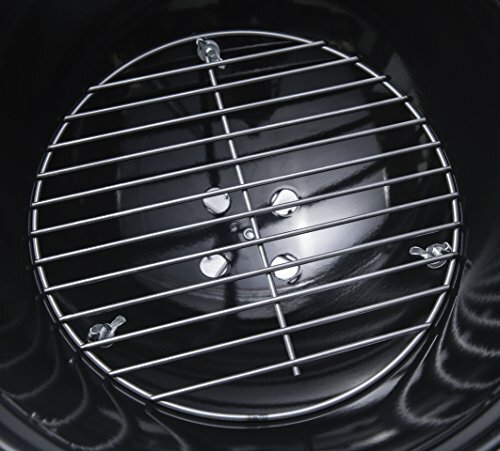 The grill surface itself is made from plated steel, to help reduce the long-term risk of rust and corrosion. The three feet provide it with a sturdy base. However, it can still be prone to tipping if it is accidentally bumped. 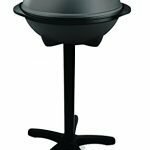 Smaller charcoal grills like the portable 14-inch Smokey Joe are typically prone to suffering from flare-ups. At the same time, the somewhat limited grilling area makes it hard to grill for a large number of diners. It also makes it difficult to grill over indirect heat or hybrid grilling. 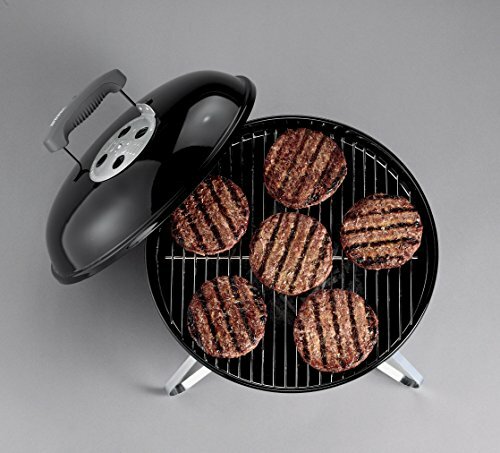 Essentially the Smokey Joe is better for making quick burgers, hot dogs, or brats. If you want to make a while chicken or grill more than two bone-in chicken breasts, you will likely experience flare-ups and other overcrowding issues. 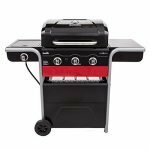 The 14-inch plated steel grill grate offers 147 square inches of grilling space. There is no warming rack available with this unit. It’s also worth noting that the grill grate does not include any form of nonstick protection. Whenever possible, you should use a tongs and clean paper towel to lightly grease the grate with a small amount of a high smoke point oil like peanut oil, before grilling. Plated steel offers a minimal amount of rust and corrosion resistance. Making sure to thoroughly scrape the grate after every use will help maintain it. Then store in a dry space. 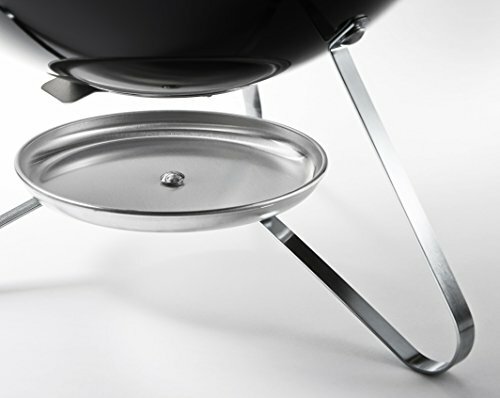 The Tuck-N-Carry lid lock helps you secure the Smokey Joe while transporting it. At the same time the lid’s handle is made from glass reinforced nylon to reduce your chances of burning yourself any time you need to open the lid. The owner’s manual also includes some sample recipe ideas to help you make the most out of your new portable grill. This can be handy if you are new to charcoal grilling and just want to get your feet wet. Like all charcoal grills and the ash and any remaining coals need to be removed from the firebox when not in use. 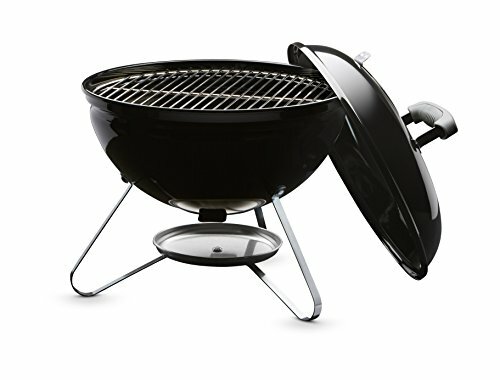 Since it is so lightweight, it doesn’t require the normal tedious scooping of a larger charcoal grill. You can simply turn it over to dump it out. However, safety can still be a concern here, as a charcoal coalbed that has been suffocated by closing the dampers might feel cold on the outside, yet the embers might still retain some heat. When exposed to oxygen again even a small amount of residual heat can cause them to light on fire. Whenever possible, you should carefully empty even seemingly cold ashes into a metal bucket and leave it covered for at least 24-hours before disposing of it in the garbage can. If you like you can stir a little water into the metal bucket to further help extinguish any potential heat. You should not pour water directly into the firebox of a charcoal grill as this could lead to increased problems with rust and corrosion. The steel-plated grill grates will also need to be scraped clean after you are done grilling. Most of the time you can simply leave the grate in the grill while the fire goes out. This will usually dry out any stuck-on material making it easy to scrape away before disposing of the ash in the firebox. The plastic components have a 5-year rust and burnout warranty, which includes fading as well as discoloration. All other parts and components have a 2-year warranty. 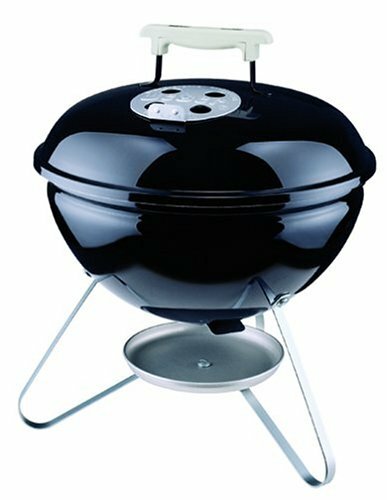 If you need a charcoal grill that’s lightweight and easy to take with you when you are on the go, the 14-inch Smokey Joe by Weber certainly ticks all of the important boxes. It provides you with the grilling space to prepare food enough food for four to five diners when you are camping, tailgating, or just cooking lunch at the beach. With a little forethought for safety and cleaning, you should be able to maintain the grill beyond the manufacturer’s expected warranty.